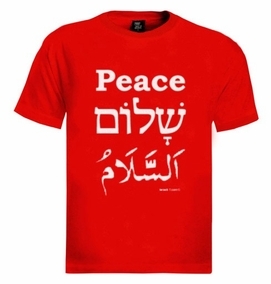 A beautiful print which symbolizes the life in Israel, the word "Peace" written in Hebrew, English and Arabic. "It's is a beautiful sight to see" is written below. High-Quality T-Shirt with unforgettable print. Our t-shirts are made of 100% cotton and are long lasting with bright colors. Our products are all designed and printed in Israel.